A group of Green Bay-area youth recently had an opportunity many kids only dream of―to meet and play football with current Green Bay Packers players. On November 9, Associated Bank hosted a Flag Football event in partnership with the Green Bay Packers and two area nonprofit organizations―Greater Green Bay Habitat for Humanity and NeighborWorks Green Bay. 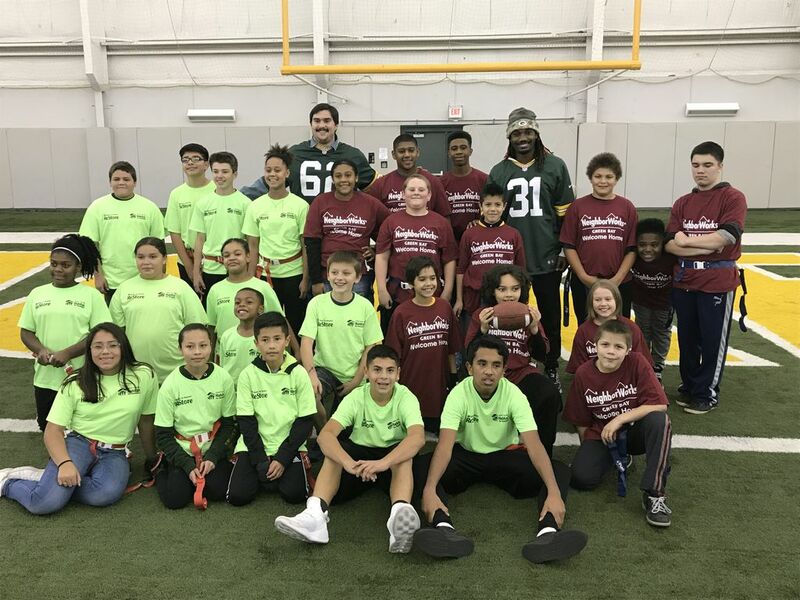 Thirty local youth were invited to participate through those nonprofits, and were greeted at the Don Hutson Center field by Packers players Devon House and Lucas Patrick. After a warm-up and team introductions, the group participated in a 25-minute flag football scrimmage, followed by team photos and an autograph session. Kids and their parents were then treated to dinner at 1919 Kitchen & Tap at Lambeau Field. “In addition to being a fun time for everyone involved, the event provided a great way — through our marketing sponsorship with the Packers ― to help strengthen our relationship with these nonprofit partners working towards safe and attainable housing in our community,” said Erica DeQuaine, corporate events & volunteer program manager, Associated Bank.